A slacking employee will not become a star performer just because you limit their social media access. A recent survey conducted by the Pew Research Center confirmed what I have long thought. Your employees are using social media at work — 77 percent of them. And I believe even that number is low. Meanwhile, another recent survey, this one by CareerBuilder (h/t Ragan.com) attributes smartphones to the fact that 20 percent of full-time workers say they work less than five hours per day. 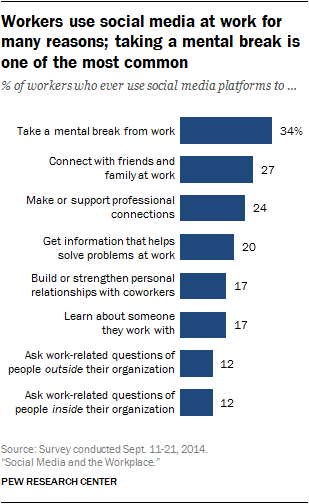 30 percent of workers whose companies have an at-work social media policy say they use social media while on the job to take a break from work, compared with 40 percent of workers whose employers do not have such policies. 20 percent of workers whose employers have at-work social media policies say they use social media to stay connected to family and friends while on the job, compared with 35 percent of workers whose social media use is not regulated at work. Only 16 percent of workers whose companies regulate social media at work say they use social media while working to get information that’s helpful to their job, compared with 25 percent of those whose workplaces have no such regulations. What does all this mean? Despite the help that social media policies provide, employers that try regulate personal social media use out of the workplace are fighting a losing battle. I call it the iPhone-ification of the American workforce. No matter your policy, if your employees can take their smartphones out of their pockets to circumvent the policy, how can you possibly police workplace social media access? Why have a policy you cannot police and enforce? And, don’t forget, the NLRB is watching, too. Instead of regulating an issue you cannot hope to control, treat employees’ use of social media for what it is — a performance issue. If an employee is not performing up to standards because he or she is spending too much time on the internet, then address the performance problem. A slacking employee will not become a star performer just because you limit his or her social media access; he or she will just find another way to slack off.